Tour of two of the holiest Hindu pilgrimage sites - Varanasi & Ayodhya - along with Allahabad Kumbh Mela tour. After breakfast drive to Allahabad via Chunar Fort - located in the Mirzapur district. According to the Puranas the oldest name of Chunar was Charanadri as Lord Vishnu had taken his first step in his Vaman incarnation in the dynasty of Great king Bali. However Chunar came into prominence after the visit of Babar followed by Shershah Suri, Humayun, Akbar, Aurangzeb and finally the Britishers. It is said that Maharaja Vikramaditya, the king of Ujjain established the fort of Chunar. According to the Alha Khand, King Sahadeo made this fort as his capital and established the statue of Naina Yogini in a cave of Vindhya hill. To commemorate his victory on 52 rulers, King Sahadeo built a stone umbrella inside the fort. Later drive to Allahabad to see the Triveni Sangam-confluence of the three rivers- Ganga, Yamuna and Saraswati . Allahabad also known as Prayag is an important pilgrimage center of the Hindus. 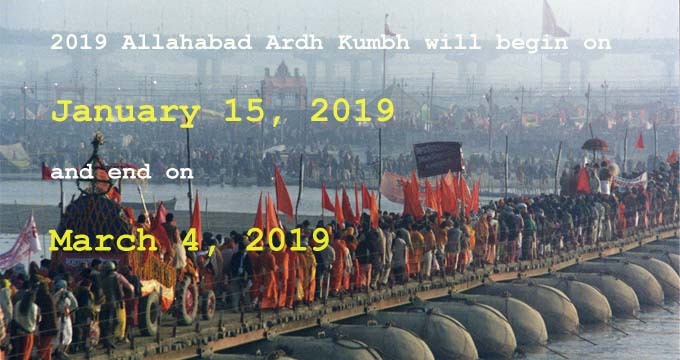 It is one of the four venues of the "Kumbh Mela". Upon arrival check into Camp. Dinner will be served at the camp. Overnight stay at the Camp (Tented Accommodation) Hotel accommodation also available. Overnight stay at Camp (Tented Accommodation) Hotel accommodation also available. After breakfast drive to Ayodhya./ Faizabad- the birth place of lord Rama who is an important deity in the Hindu pantheon. It is an important pilgrim place for Hindus. It is one of the seven holiest cities of India. This small, quiet town attracts pilgrims from all over the country. Hindu pilgrims visiting Ayodhya during festivals and important religious functions consider a holy dip in the sacred Saryu River very auspicious. Upon arrival check into hotel. Rest of the day free at your leisure. Overnight stay at the Hotel. After breakfast take a visit of Ayodhaya, visiting Ram Janma Bhoomi. Also visit Hanuman Temple, Seetha Temple, Ammaji Mandir. and other places. You can take a holy dip in Saryu river. Later drive to Lucknow. Upon arrival check into hotel. Overnight stay at the hotel. After breakfast have a sightseeing tour of Lucknow city which includes Bara Imambara and Chhota Imambara, the monuments with great historical significance. Rest of the day free for shopping or at your leisure times. After breakfast have another leg of sightseeing which includes Lucknow, visiting Dilkusha Garden, Shah Najaf, Ram Krishna Math, Moti Mahal, La Martiniere, Chattra Manzil.